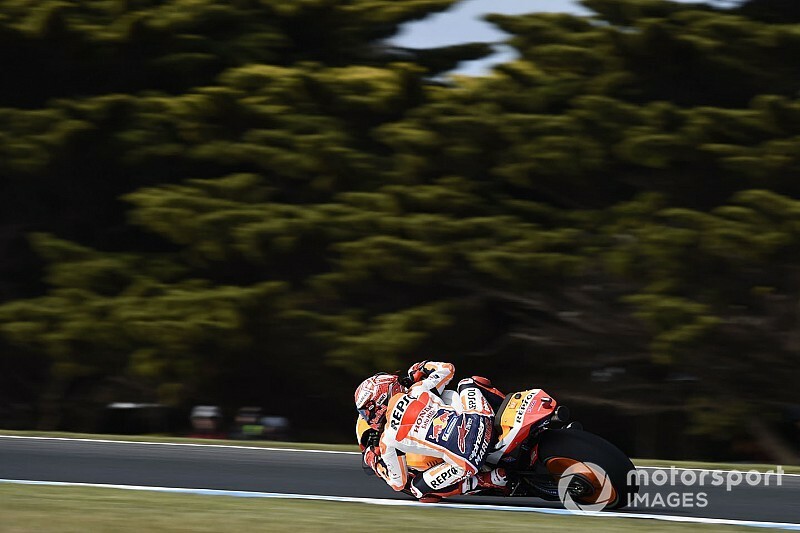 Marc Marquez edged Maverick Vinales to top the third free practice session for MotoGP's Australian Grand Prix, as there were no changes to the Q1/Q2 split compared to Friday. 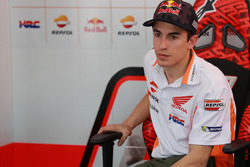 There was no rapid decline in lap speed early in the session, times hanging in the 1m31s for the first five minutes before Marquez led a charge into the 1m30s before the 10-minute mark. 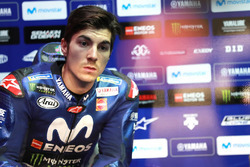 The World Champion's 1m30.581s was the initial benchmark, Marquez then improving to a 1m30.110s several minutes later. 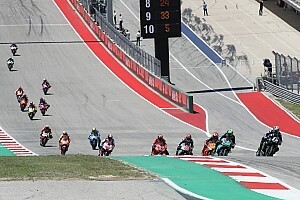 At that same point Turn 1 claimed its second victim of the weekend, Tech 3 Yamaha rider Hafizh Syahrin low-siding at high speed as he went to brake into the left-hander. The Malaysian was retrieved by safety crews, his session over on the spot as he was sent to the medical centre. With 25 minutes to go Marquez emerged from the garage with rear hard tyre, but didn't even get around his out-lap before hitting the deck at Turn 4. He was quickly back on his feet and back the garage after the low-speed tumble. While that was going on Andrea Iannone took over top spot, the Suzuki rider first into the 1m29s with a 1m29.867s. Vinales then got in on the act with 10 minutes to go, replacing Iannone with a 1m29.756s despite running a hard compound rear. With six minutes to go Valentino Rossi became the first rider in a Q2 spot to improve on his Friday time, giving himself some breathing space with a 1m29.974s. Jack Miller did likewise shortly afterwards, jumping to second on the FP3 leaderboard with a 1m29.792s, and with two minutes to go Marquez jumped back to the top of the session times with a 1m29.714s. Rossi did have one crack at top spot right at the flag, setting a quickest first sector before going straight on into the run-off at Turn 4. That secured top spot in the session for Marquez, who was left 0.04s clear of Vinales. With Miller, Iannone, and Rossi the only other riders in the 1m29s for the session, there was no change in the Q2 line-up. 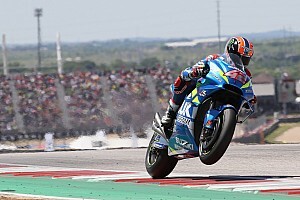 Iannone, Danilo Petrucci, Vinales and Andrea Dovizioso led the way on combined times, followed by Johann Zarco, Marquez, Miller, Rins and Rossi. Ironically Syahrin is the final man with an automatic Q2 berth, having inherited 10th on combined times after Cal Crutchlow was rubbed out of the race weekend thanks to his Turn 1 shunt yesterday.